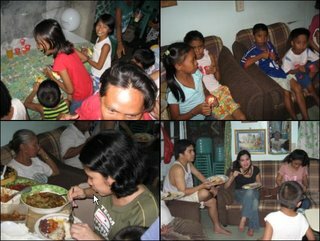 Last Sunday (19Nov06), we held a big celebration in our home called 'The Double B celebration'. It was double B because it was a birthday celebration and baptismal day! 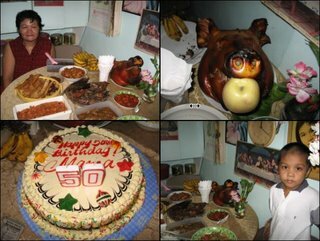 Actually, the main root of celebration was my mother's 50th birthday. She told me that her wish is to baptise the two kids of our neighbor and a child from my 'pamangkin sa tiya'. At first, I was hesitant to spend for those reasons but I realized that it was a good thing helping others to welcome their children in the world of Christianity. 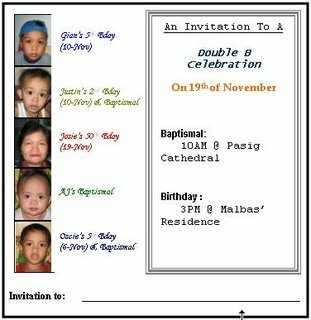 So there came the plan, first I designed the invitation card (I'm not really good in designing). Afterwards, my mom went to the church to register the kids and to pay the necessary fees for the baptismal. Then we planned the foods to prepare and hired a cook to monitor and do the entire phases of cooking. The day before the big day, my mom and I went to grocery to buy the required things and other spices for the foods. Thank God that the cook we hired was the best! Hehehe... sarap kumain! The birthday celebration came next, in the afternoon, there were so many kids, imagine 3 kids were celebrating their birthday in our small house, nakupo! My mother's visitors mostly came at night.